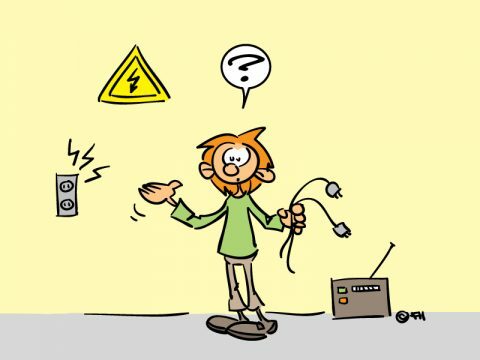 Home » Personnel » Working conditions » Working with electricity » What do I need to look out for with electricity? What do I need to look out for with electricity? Protect yourself from electrical risks by obeying the following rules. Every object should be constructed in such a way that contact with live voltage is impossible (cables, plugs, casing). If working with 'open' conducting parts is unavoidable (for example, during a repair) then you must consult a qualified expert. The risk of electrocution must be effectively limited by cordoning off the area and using warning signs/signals. If you have any doubts then check that the electrical equipment concerned is properly fused. Never install heavy-duty safety fuses yourself. Always let a qualified person do this. Use only approved tools (according to NEN 3140). In cases of doubt ask your supervisor or a qualified person. Switches, plugs and multiple socket outlets that feel warm could be making poor contact or are overloaded; let a qualified person replace these. The linking of extension leads is strictly prohibited. Extension leads, et cetera may not lay on the ground due to the risk of somebody tripping over them and the potential risk in the event of leakages. Leads and plugs must not be damaged.